Ants are among the most annoying and persistent pests that invade your home. While fairly harmless, they are attracted to food and can make their way inside your home in any season and bring hundreds, or even thousands of other ants from their colony to join them. If you have an ant problem in your home, your business or on your property, getting rid of them yourself is extremely difficult. Partnering with an extermination service can rid your home of these pests and prevent them from coming back. Eco Tech is a natural pest control service that serves the entire Minneapolis, MN area and has years of experience removing carpenter ants and sugar ants from your dwelling permanently. 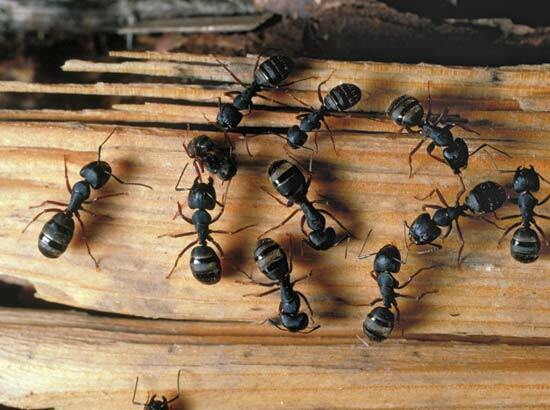 Carpenter ants are larger ants that are very common in the Minneapolis area. They generally build nests inside of wood including trees. If they make their way into your home, they can actually damage wood on and around your home by removing wood and depositing the debris outside of their nests. Removing them is very important and should be done as soon as possible. Eco Tech has extensive experience finding their nests and eliminating carpenter ants completely from your property. In addition, our team can also repair any damage left behind by the ants and put mechanisms in place to ensure that they will not return. Different types of ants require different types of treatments and our team can quickly assess the extent and type of your ant problem, find the colonies and use safe techniques to completely eliminate your problem. Sugar ants and carpenter ants are two of the most common types of ants in the area and we have specific treatment plans designed for either problem. Eco Tech is a family owned, natural pest control service that has worked in the Minneapolis area for more than 15 years. One thing that sets our company apart from the competition is that we provide all natural solutions for insect control that are safer for you, your family and your pets. The solutions that we use are environmentally friendly and target the pests we are trying to eliminate, and are safe for children and other pets as well. Eco Tech also does not force customers to commit to long term contracts and pay for services that they may not need. Instead, we offer customized insect programs that will work for you and back our work up with a 4 year guarantee.